Saint Adalgott was a twelfth-century monk and a bishop and Roman Catholic saint. He entered Clairvaux as a monk, was made an abbot of Disentis. He was well known for caring for the sick and poor people. He had also founded a hospital in 1150. 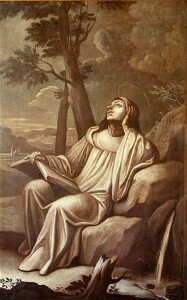 Above picture of Saint Adalgott as a contemplative; artist unknown, Baroque Swiss composition.